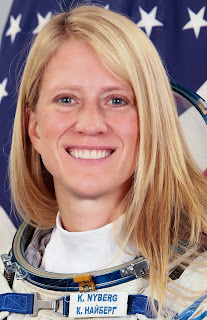 Yes you guys, for realz--Karen Nyberg, awesome astronaut that she is, has been quilting (by hand) in space. 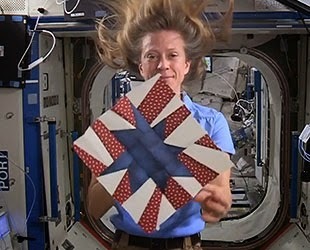 Now she challenges all quilters out there to send in a 9 1/2" star block (of any color/style) to Houston by August 1, 2014. The blocks will then be assembled and the finished quilt will be on display at the Houston Quilt Festival, the largest Quilt Festival in the WORLD. I have been practicing my stars for this challenge. I almost feel like I'm ten years old again, going off to Space Camp. It was a thrilling experience, one I will never forget. If you'd read my Bio page you know I'm absolutely serious with my last line, I really do want to be an astronaut when I grow up. Karen you are my idol! C'mon quilters let's send those stars in and represent! That does sound like fun. Is she assembling them in space? Awesome!!! This does sound like FUN. Have just sent the links to a friend who travels over to Space Camp from Australia each year.